Hi Sandra!! How unfortunate that you gave the blocks away. I know that I regret giving a number of my first quilts to the thrift store. Och well. I’ve learned not to do that again. All that lovely fruit- oh my!! And you have done a lovely job with those dresden plate blocks, congratulations! Thank you, Jenny!!! Dresden Plates are always gorgeous. I love them so much I’ve started working on one for myself! You wouldn’t even believe the fruit I have here! In addition to the saskatoons and raspberries, I have red currants, black currants, gooseberries, strawberries, apples, crabapples, and chokecherries. The previous owners were crazy for gardening!!! 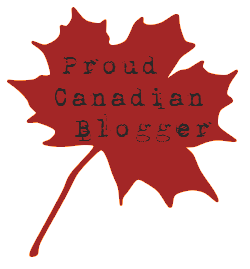 Thank you so much for taking the time to read my blog and leave a comment! i really do appreciate it! 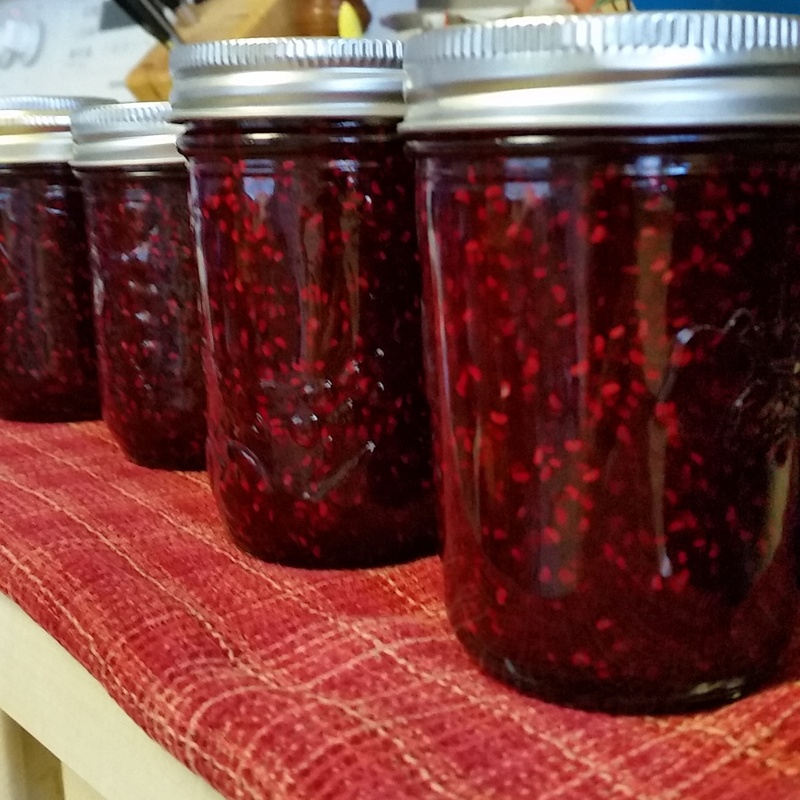 I have no idea what a Saskatoon berry is, but your jars look delicious. 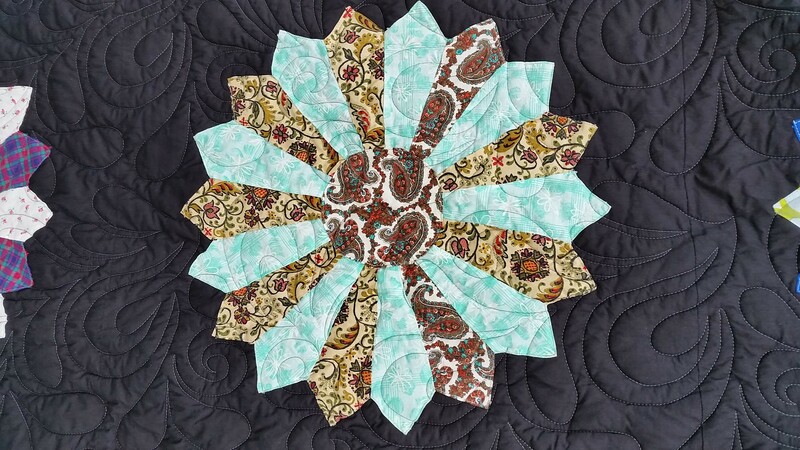 The Dresden quilt is beautiful, and your treatment of the blocks really highlights them. I love their scrappy, resourcefulness. Hi quiltingmod! Saskatoons are WONDERFUL berries! They grow wild here, but many people have domestic shrubs in their gardens. Hi Sherry!!! I’m thrilled that you stopped in! 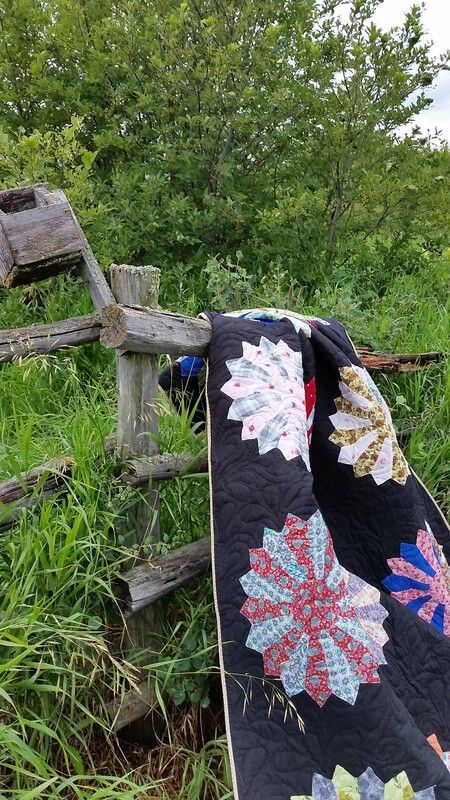 The quilt is one of my favourites! I didn’t want to give it back. hahahaha!!! 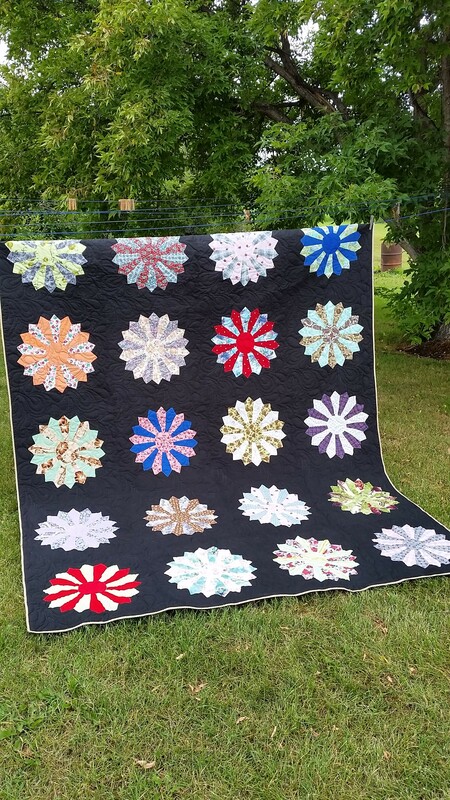 Fabulous quilt. Wonderful job you both did. I love your photography and how you displayed it. I’ll be following you. It was nice to meet you. I came over from Crazy Mom. 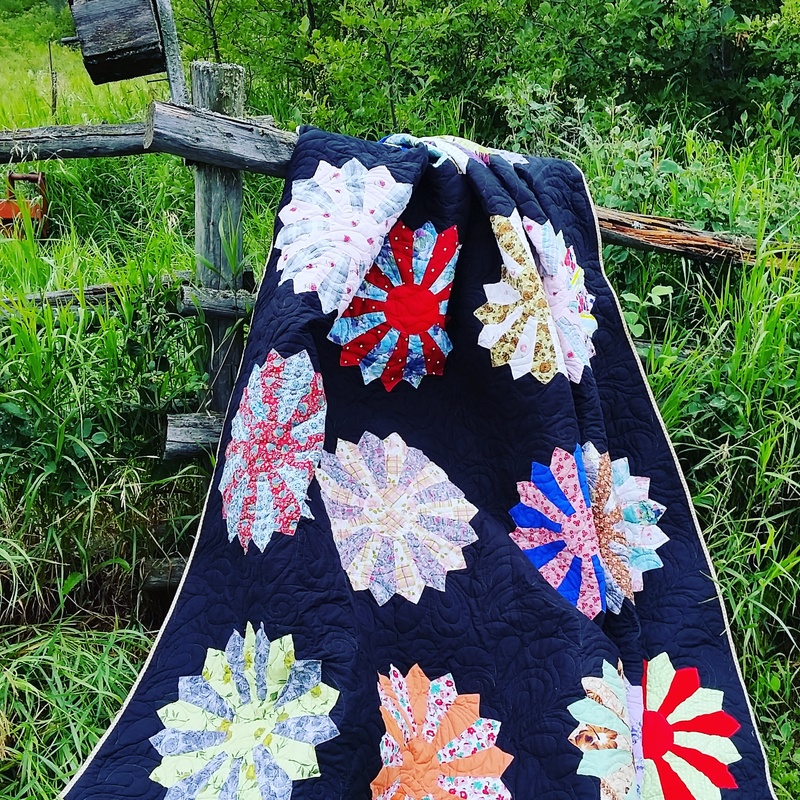 Gosh, that’s a gorgeous quilt! I’m sure Opal is thrilled with it 🙂 You’re right, the black background really makes those Dresden pop up and steal the show. It’s really quite modern feeling, even though it’s a traditional block. Timeless and beautiful! These Dresdens are gorgeous! I love that you put them on a black background. They really do shine! 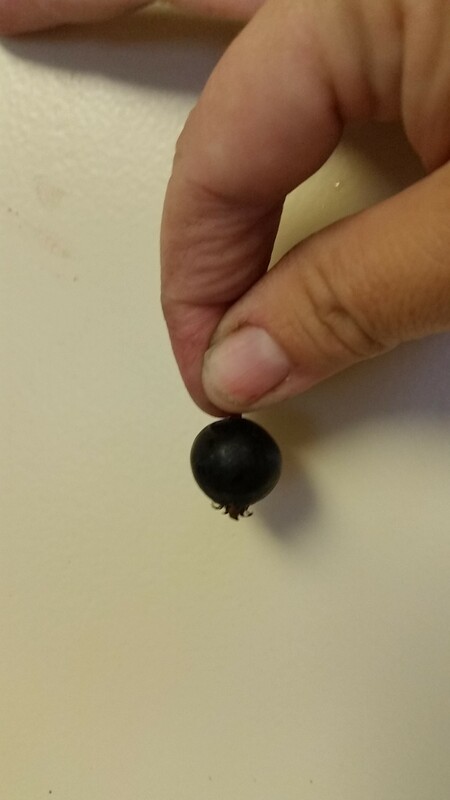 I have no idea what Saskatoon berries taste like, but I’m betting I’d enjoy them. I haven’t found a berry that I didn’t like, especially in pie. We too have Saskatoons (wild) on our property and they are just insane this year! Big, fat, juicy clumps like mini-grapes. Our freezer is full & I had to tell my husband no more picking! How wonderful! 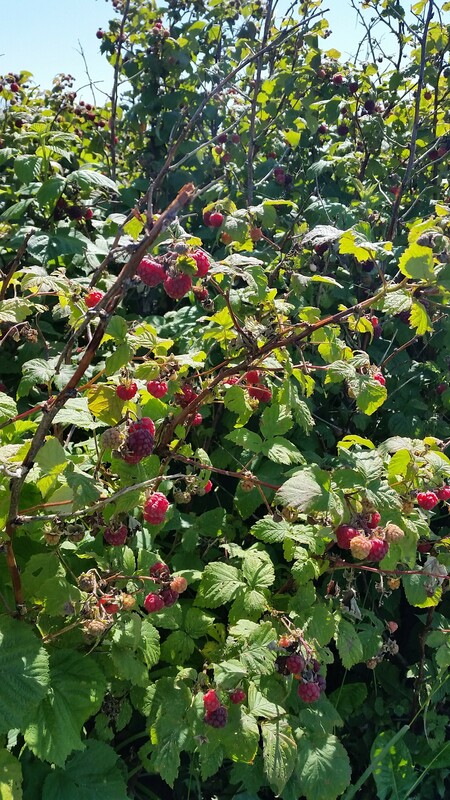 We had to stop picking raspberries or we wouldn’t have had room for anything else!